Here is our crazy group all smiles at 7am before we started riding. as the morning progressed the weather got colder and we all got wetter.... everyone did such a great job and worked so very hard...despite the not so pleasant training conditions everyone did their best... I am so very proud of our team! we have a GREAT group of very dedicated folks who are out training hard and trying to help find a cure!! Thank you to all who have donated so far... Wasey and I are at 20% of our goal...we know we can make it but we need your help to get there. 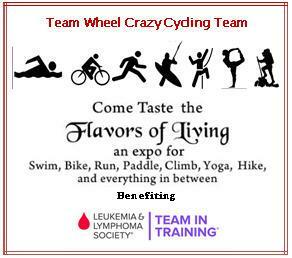 Come taste the Flavors of Living: Swim, Bike, Run, Paddle, Hike, Climb! Entry to this event gets you complimentary food and beverage samples, access to amazing discounts at vendor booths, and a chance to participate in the most "Active" Silent Auction you've ever experienced, featuring outfitters, clothing and gear stores all closely connected to the theme of active living! 100% of proceeds from this event benefits The Leukemia & Lymphoma Society via our Team In Training Century Cycle Team, in our effort to raise money for LLS while training to ride 100 miles at America's Most Beautiful Bike Ride around Lake Tahoe. Team In Training's Cycle Team is jointly raising funds and awareness in the fight against blood cancer, as we train weekly for their 100 Mile (Century) Rides in June. We must be crazy! We thought so too, and call ourselves Team Wheel Crazy! Admission to this event processed on this page will be credited towards my fundraising goal ($3,900), and each silent aucton item will be credited to the teammate who secured the items. 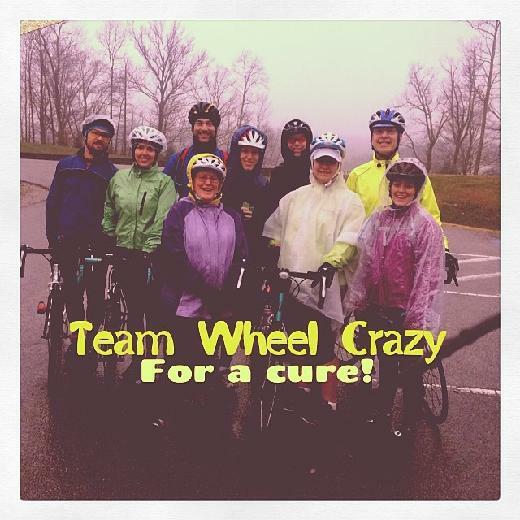 Together, Team Wheel Crazy is raising over $35,000 this season! Bring your kids for only $1 admission per kid (under 16 years old), and let them hang out in the KID ZONE! There will be crafts, active living demonstrations geared towards kids (bike safety, how to help your parents pack for camping, how to inflate a bike tire), and storytime. Keep your kids entertained and happy while you mingle with fellow active outdoorsy adults! Children Policy: This is a family friendly event, with a KIDS ZONE! Here was our route for the day..
See those hills!! WOW... I have lived in Tennessee my whole life and one thing I know is that it's pretty hard to go anywhere without some hills. Why are you doing this? Why are you riding your bike? Why are you raising money for this cause? Of course this then started the dialog of conversation.... and more tears... God reminded me in my moment of pain that THIS is not about me...This pain, frustration and fear is temporary… He also reminded me I could quit.. I could give up…. He also reminded me of my why…Why I had chosen to ride my bike and raise money for a cause…….for our friend Becky. A wife, mother, sister and daughter…going through radiation daily for cancer…. He also reminded me of Susan…A dear friend, Wife and mother, who recently finished daily radiation treatments and is waiting to find out if she has to do it again, have more surgery or if the tretment worked… again He reminded me of my sister in law, Shelley, who lost her battle with cancer…. And all those who I hear of on what seems to be a daily basis finding out they have cancer…. Pain, Frustration and fear are common with cancer patients… They can’t quit.. They can’t give up… They want to quit and They want to scream, I’M DONE!! THIS IS STUPID I QUIT….…. They endure…. HOURS in a waiting room, HOURS waiting… Tests, medications, pain, frustration and fear… and more waiting…. God reminded me WHY I choose to do this…. 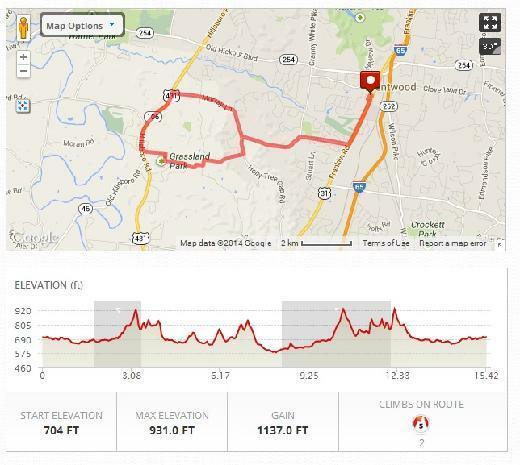 And that my short time of frustration, pain and bike riding is all part of a bigger picture…. To help find a cure! To encourage and support those suffering with cancer and to remember those who lost their battle. Take a moment today to donate to our team help us raise money to find a cure! 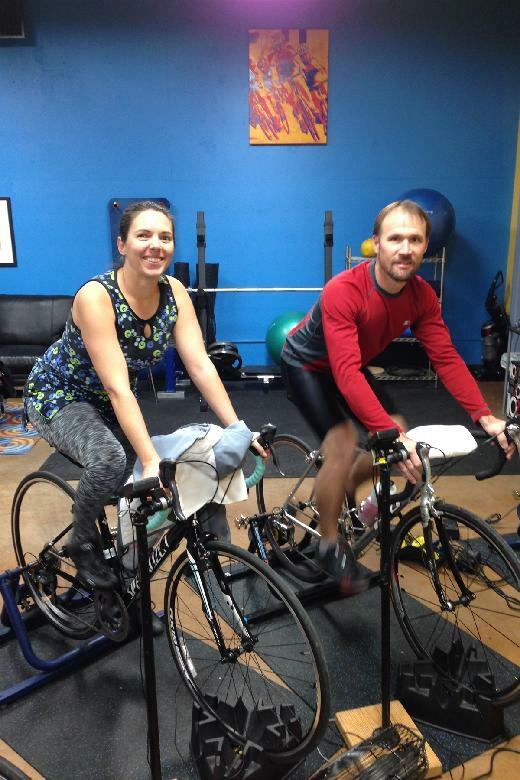 We have spent our last 4 Saturday Mornings at an indoor cycling class at Endeavor Performance with coach Todd. And by Saturday Morning I mean... alarm going off at 4:30am.... hitting snooze until 5am... finally rushing around getting ready to make our 6am class. 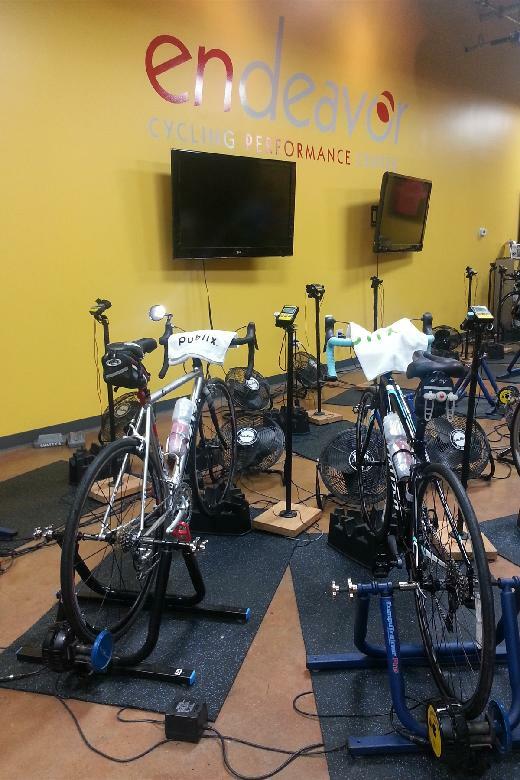 When we arrive to class we are welcomed by 2 rows of Bike trainers. We pick a spot and load our bikes on computerized trainers and get ready. We are all smiles now.... However we know Coach Todd is about to put us through the ringer! So for the next hour we cycle "up hills" and "down", faster and even faster.... just when I think my legs are going to give out we get to the "easy pace" of our ride and then our cool down and the class is over. This morning it was nice to see the snow falling during class. It was a nice distraction from class ... I have to admit I was hoping that we would get more than a dusting. 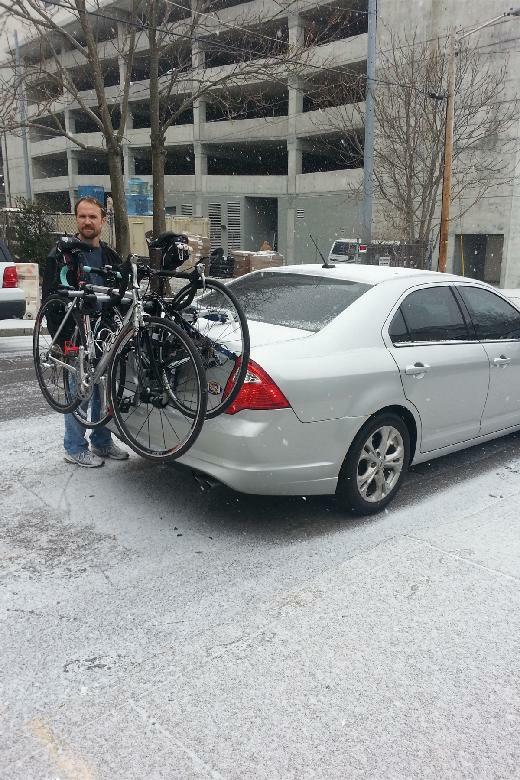 We loaded up our bikes and head out to breakfast with our group to discuss the class and our fundraising. Be sure to follow our adventures on this blog. You can also donate to the Leukemia and Lymphoma society on the Right of this page. "I would like to make this donation in honor of Niki Yarbrough who continues to inspire me to keep going even when the going gets tough and coached me through to my first three marathons. To Laura Campbell who has been a source of encouragement through all my running endeavors. To Jill and Wasey for this new found friendship. Good luck to all Team Wheel Crazy! You all are going to do so awesome! 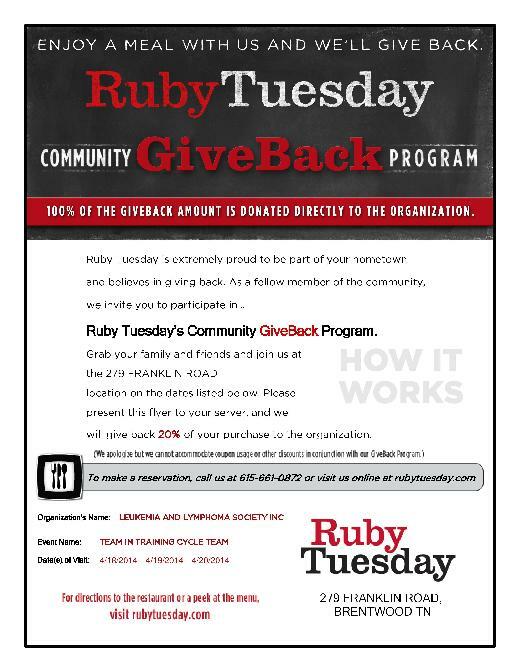 Thank you for helping the Leukemia and Lymphoma Society."